The roofing system is the most essential component of a mobile home's structure. Single and double wide house roofs withstand snow, rain, hot weather, hailstorms, ice, trees, windstorms, hurricanes. twisters, and lets not overlook animals. Your roof does not only safeguard the building below. It also provides a safe harbor for your household, which is the roofs most important function. Mobile homes may be equipped with a few different types of roofing material. Most mobile home roofs will be assembled with asphalt shingles or metal. Asphalt shingles are the most ideal type of roof material to use when the home has a high pitch. This is also known as a high slope roof. Most mobile home roofing installations in the past were made with flat roofs or low slope roofs. Today home owners are opting to go with roofs with a steeper slope for a few good reasons. Flat roofs do not drain water away from the house like high slope roofs. Flat roofs also have a shorter life cycle for this reason. Rainwater has the potential to pool up on a flat roof. This can result in roof leaks and also accelerate the need for roof repair. There is also aesthetic reasons to go with a high slope roof. This style of roof will give your mobile home a more modern look while still providing superior protection for the rest of the house. Often times your roof is the culprit when it comes to your house not being energy efficient. A house that is not properly insulated will cost you a lot more in heating oil, electricity, and energy expenses. This begins with the roof. Heat rises to the top. If your roof is not insulated, you will always find yourself raising the thermostat in your home to keep it warm. Most mobile home roofs are insulated with fiberglass or spray foam. Here are some things to keep in mind when it comes to making decisions about your mobile home roof. Before you go for a total roof over, you need to check to see its possible to repair your mobile home roofing system. Usually membrane roofs like TPO and EPDM can be repaired. Most mobile home roofs in North America are constructed with a metal or rubber roof. We will begin by discussing metal roofs first. When contractors refer to metal roofs, they usually are referring to using aluminum. Aluminum is a very popular building material due to its versatility. It can accommodate roofs of high and low slopes. Aluminum is light-weight and very durable. Most standing seam roofs are constructed out of aluminum. Aluminum roofs usually carry long manufacturer's warranties. They are easy for a roofer to install and require little repair and maintenance. When you are re-roofing your mobile home, you can also install insulation at areas that need it. If you are installing a metal roof over your existing roof, it is common practice for roofing contractors to add insulation between your original and new roof. This saves money in the future, because the new insulation will help prevent drafts and help you maintain the temperature in your house. Adding insulation to your metal or asphalt roof is also important to stop ice damming. Ice damming is when layers of ice form in the gap between your gutter system and your roofing shingles. Ice damming results in water pooling on your roof; due to the waters inability to drain correctly into your gutters. With new innovation advances, it is encouraged to avoid using flat roofs on your manufactured home. Flat mobile home roofing systems are synonomous with roof leaks. They are more vulnerable to having problems. One of the problems with flat roofs is poor water drainage. Water has the propensity to accumulate and pool on flat surface areas. On a roofing surface like shingles or metal, this can bring about a roofs early degeneration. Flat roofs also have a larger surface area that is exposed to the sun's heat. That is why you should choose a material like TPO that has strong reflective characteristics. Rubber asphalt roofs also have a tendency to blister as a result of the heat. This can produce roof leaks and ripples in the roofs exterior lining requiring repair. Most newer manufactured homes are manufactured with pitched roof systems. 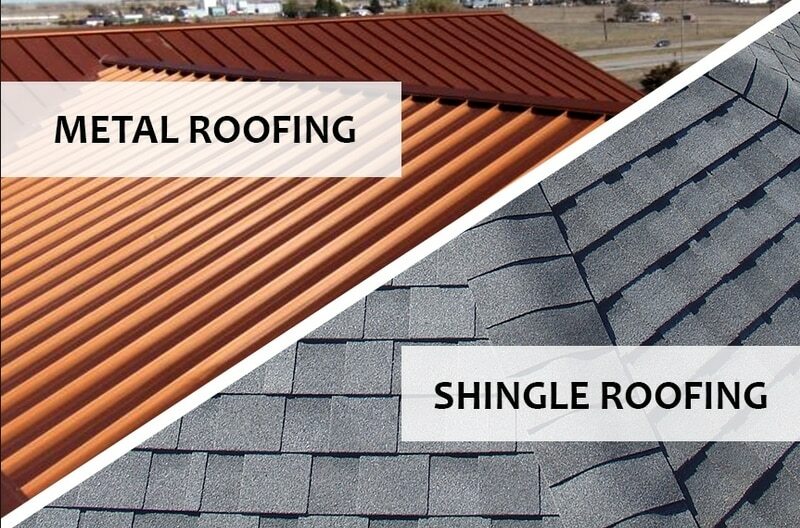 The premier roof components of choice today are metal or asphalt shingles. Shingles have become the roof replacement material of choice for the majority of non commercial applications. Shingles are relatively easy to install, they can last 25-30 years, and they add an aesthetic beauty to your home improvement project. A shingle roof can have more than just one layer. Your manufactured home may not need a whole new roofing replacement. If you already have asphalt shingles. It is possible to add another layer of shingles to your existing roof. This is commonly done to repair leaks when asphalt roofs near the end of their functional life. TPO is an additional option. TPO is a roofing membrane that is used on both high and low slope roofs. It is reflective, budget-friendly, and easy for a contractor to install. It is commonly referred to as rubber roofing. Usually you will have two roofing options. Either repair your roof or replace your roof. The installation prices of the roof will differ depending on materials used, the roofing contractor, and the type and size of the roof. Although roof cost is important, it is not advisable to cut costs here. A roof poorly installed can result in a continual demand for roof repair. This is why we do not suggest rolled rubber roofing for your mobile home. Mobile home rubber roof coatings are an easy method to keep your mobile home air-conditioned. This process involves applying a elastomeric coating to your roof to reflect the suns heat. This will help you with air conditioning expenses. It also helps keep your roof from having roof leaks because this material will bond to the existing roof surface to keep water out. When this liquid rubber is applied around protrusions like double wide roof vents and chimneys, it will function like flashing. It is customarily spread with a brush. This is a necessity for mobile homes with flat roofs. Most roof coatings are asphalt based. One other roof coating option is latex. Latex has shown to become a more reflective coating roof material than asphalt. Latex will require using a primer prior to putting on the actual coating. It is recommended that you reapply a roof coating to your flat roof every few years to preserve its integrity. Any type of roofing system that you choose for your manufactured home will need a regular repairs and maintenance plan. You should consult with your roofing specialist and find out about your roofing options. It isn't advised to do a roof replacement yourself. Whether or not you should use asphalt shingles, rubber roofing, or metal roofing on your manufactured home will very likely depend upon your surrounding weather conditions, the quality and expertise of your roofer, and how much money you are looking to spend. This guide should be able to give you some assistance.